“Too many nail techs think they just have to ‘buy this’ and all their ventilation problems are solved, but it’s not that easy,” says Doug Schoon, safety co-chair for the PBA’s Nail Manufacturers Council (NMC). “Achieving proper ventilation and good air quality requires more than many imagine or recommend.” To ensure good salon air quality, the NMC has expanded its brochure “Guidelines for Controlling and Minimizing Inhalation Exposure to Nail Products” to provide a more comprehensive three-zone approach to ventilation. The NMC recommends using a combination of: 1) a properly maintained HVAC system; 2) a professional HEPA room air cleaner; and 3) a source capture system. HVAC Systems. The general room ventilation and air-conditioning systems in a salon are classified as “Heating, Ventilation and Air-Conditioning” (HVAC) systems. HVAC systems are built-in to the salon and are designed to exchange air inside the salon with fresh air from the outside. Typical salon HVAC filters remove some dusts, pollens, etc., but cannot remove vapors or the smallest dust particles. Special HVAC filters designed with replaceable activated carbon panels and electrostatic dust-filtering material are recommended to remove residual salon vapor and dust not captured by a source capture system or by a room air purifier. The adsorbent panels eventually become saturated, making them ineffective, and, therefore, must be replaced on a regular basis (e.g., four times per year). Whether the salon is being heated, air conditioned, or neither, the HVAC fan should be in the “on” position if the building is occupied. Professional HEPA Room Air Cleaners. Use of a stand-alone salon HEPA room air cleaner designed specifically to remove salon vapors and dusts is also recommended to help further clean the salon’s air and to help keep it recirculating throughout the salon. It is best to use a professional quality air cleaner and avoid air cleaners designed for home use. Air cleaning devices that utilize HEPA filters are designed to remove most dusts from the air in the immediate vicinity of the air cleaning device, but will have much less effect on the breathing zone of nail technicians. Even so, they can be effective for removing fine dusts from the salon air. Newer types of filters referred to as electrically enhanced filters or polarized filters can be considered electronic versions of HEPA filters and are commonly called eHEPA filters. These claim to have the effectiveness of HEPA type filters, but allow substantially more air flow to pass through the air cleaning device. Both HEPA and eHEPA filters are designed to remove particles as small as 100th the diameter of a human hair and when used properly and according to manufacturer’s directions can provide dust removal benefits to salons. Some activated charcoal air cleaner devices utilize a dust pre-filter that is machine washable or replaceable. These devices are also considered effective ways to lower airborne dust concentrations. Note: Never rely solely on stand-alone air filtration in the salon. Source Capture Systems. Source capture systems are designed to capture nail vapors and dust particles at their source of release and then extract them from the breathing zone, protecting the health of those working in the salon. At a minimum, these systems should draw 50 cfm of airflow when measured within six inches of the area where the dusts and vapors are released. A three-stage filtration system is recommended and should include an activated carbon filter with a minimum of two pounds of activated carbon. Avoid systems with little or no activated carbon. Additionally, some systems are equipped with eHEPA filters which have enhanced dust collecting and vapor adsorption capability. When properly designed and correctly used, source capture systems protect the breathing zone of both the nail technician and client. These systems are the most effective way to control and prevent inhalation of salon dusts, vapors, and other airborne contaminants. Source capture systems that return filtered air into the salon are not as effective as those designed to vent to the outdoors and are more costly to maintain, so when possible, source capture systems should be ventilated to the outside. However, when this is impractical, systems that clean the air and return it to the salon can be very useful if properly maintained. > You can read the complete NMC brochure at www.nailsmag.com/handouts. 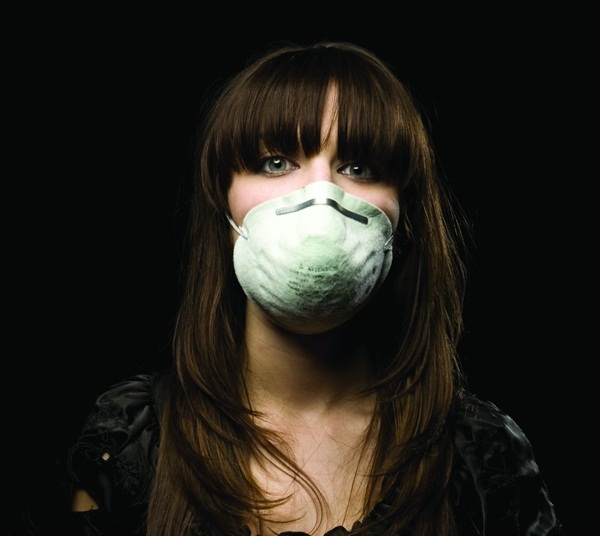 It includes information on product overexposure, dust masks, and other safety tips. > Learn about the Aerovex Three-Zone Certification program at www.aerovexsystems.com/nail-salon-air-purification-systems/nail-salon-certification.asp.